The actor sports her girly side on the cover of Cosmopolitan. 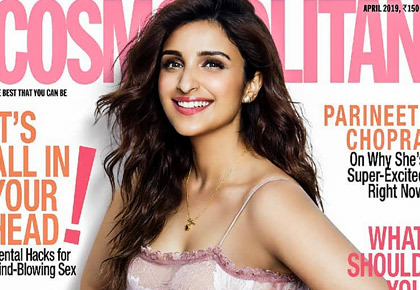 Say 'hello' to Cosmopolitan's April 2019 cover girl, the vivacious Parineeti Chopra. Rocking a pink frilled skirt with a matching bodysuit, the actor looked gorgeous in pink. She rounded off the look with a brown belt and her lovely smile. In an interview with the mag, Parineeti has shared her views on sisterhood. 'We are really close, Priyanka and I. Even though she's my sister, I consider her a friend, and go to her for advice often,' she told the mag.